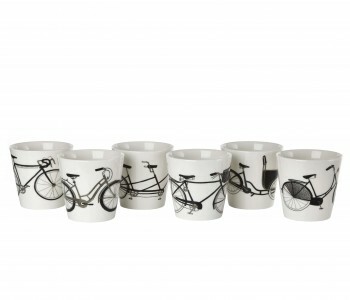 This porcelain set from the Bike range comprises six white cups, glazed and featuring black and silver decoration. Fun images of different types of black bikes. 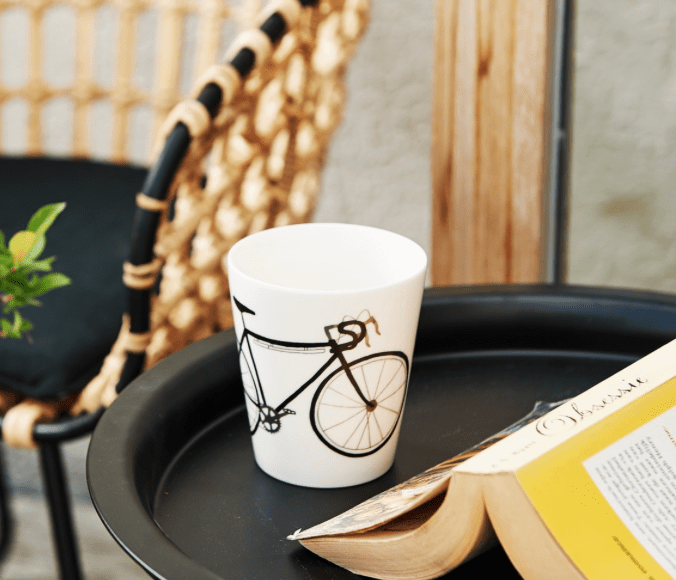 Designer Esther Hörchner created the Bike cup set for Pols Potten. The cup set is delivered in an elegant gift box making it ideal as a special gift! The Bike cups set comprises 6 white porcelain cups, glazed and featuring black and silver images of different types of black bikes. The whole set is packaged in a nice black gift box. For long-lasting colour retention, we advise washing the cups by hand. Perfectly suited for private use but also as a particularly original gift. Esther Hörchner studied graphic design and illustration at the ArtEZ College for the Arts in Arnhem. Her work focuses on illustrations of people and animals printed onto porcelain, leather, paper, and fabric. Her design philosophy; ‘to design with love and care’. You can certainly see that in her creative Bike cup set. For centuries, tea drinking has been an important part of the day. It is healthy, helps with relaxation, and brings people closer together. Pols Potten also finds it important and that's why they design so many creative tea accessories, such as this bike cup set, the Freedom bird cup set and the Undressed tea cup set. Have a look around the webshop for more lovely cups and teapots!